Youth sports specialization is on the rise. As a result, the prevalence of pediatric ACL injuries is also increasing. Join Columbia University Sports Medicine on November 13th for Pediatric Sports Injuries: Treating our youth from head to toe to learn about the latest techniques for prevention and treatment of these injuries in our young athletes. Children are playing sports in record numbers across the United States, and with this increase in participation there has been an alarming rise in the number of sports injuries. Taking optimal care of these injured kids requires extensive knowledge and comfort in techniques that have previously been thought of as only pediatric, or only adult. This webinar reviews and discusses treatment strategies to maximize outcomes and get these developing athletes off the sidelines and back onto the field. Understanding the etiology, diagnosis, surgical, and non-surgical modalities are the key elements of a successful treatment plan. This course will be of interest to Team Physicians, Certified Athletic Trainers, Physical Therapists, Primary Care Sports Medicine Physicians and coaches of all youth levels. Back Pain in the Developing Athlete: When should you be concerned? 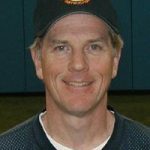 The Tommy John Epidemic in Youth Throwers: How can we stop it? This course is free to all participants. 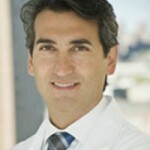 This is a great chance for you to get the latest advances in shoulder arthroplasty. 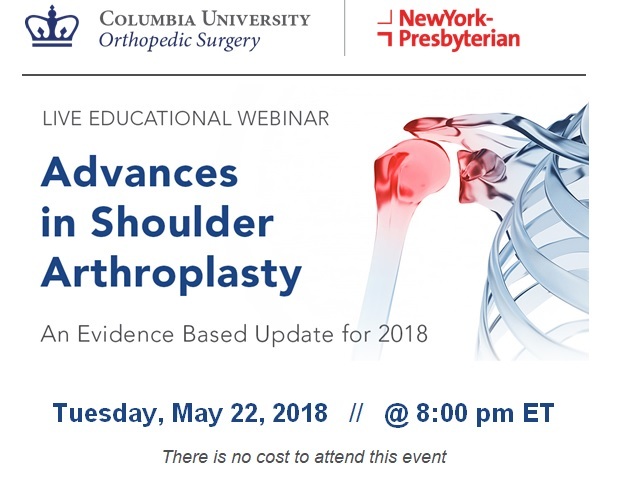 Baseball Health Network founding member Dr. Christopher Ahmad and the team at Columbia Orthopedics invite you to a free live webinar event – Advances in Shoulder Arthroplasty: An Evidence Based Update for 2018 – on May 22 at 8 PM EDT. The management and treatment options for early, middle, and late stage shoulder arthritis has been under much debate in recent years. As implant technology improves, so do the treatment options available to surgeons. Sound judgment and understanding the anatomic difference can improve treatment outcomes. This course will discuss both empirical research and clinical findings related to: stem design and length, new evidence surrounding next generation glenoid implants, and debates on what materials are best for a reverse total shoulder with glenoid deficiencies. Stemless, Short-stem, Long-stem: Does it Matter? Posterior Glenoid Bone Loss in Cuff Intact Arthritis: What Should We Do? What’s the Evidence on New Generation Glenoid Implants? Reverse Arthroplasty with Massively Deficient Glenoid: Autograft, Allograft, or Metal? This course will be of interest to Orthopedic Surgeons, Primary Care Sports Medicine Physicians, Physical Therapists, Certified Athletic Trainers, Residents, and Fellows. You’re invited to a special seminar Saturday April 14, 2018 at Convene in New York City, hosted by Dr. Christopher Ahmad of the Baseball Health Network. Raising the Game 2018 provides an in-depth update on current research and evidence-based practice regarding clinical examination, differential diagnosis, and non-operative and operative management of hip and knee sports injuries from the world-renowned faculty of Columbia University Medical Center and New York-Presbyterian. Complete course details can be found here. Attention: Team Physicians, Certified Athletic Trainers, Physical Therapists, Primary Care Sports Medicine Physicians, runners of all skill levels and outdoor enthusiasts. 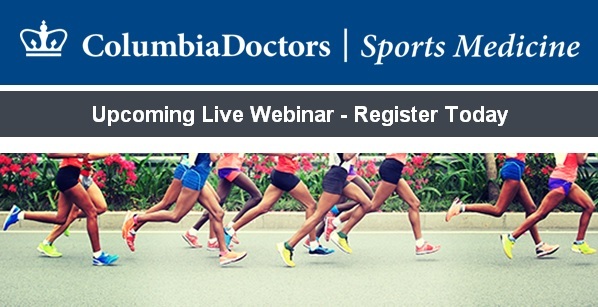 Columbia Sports Medicine is presenting another free live webinar on Tuesday September 5 at 8PM that is perfect for you – The Science of Running: How to Stay Healthy and Optimize Performance. Recreational and organized sports participation is on the rise. The pressure to get athletes back to sport as quickly and safely as possible continues to increase. This course will serve to highlight important topics in sports medicine that are experienced at the highest levels on a daily basis. The management of athletic injuries is under constant debate, often needing to decide between conservative and surgical intervention. Good judgment of the sports provider is vital as management decisions are usually tailored to the individual athlete. Optimal management of these injuries is essential to an athlete’s career. Understanding the etiology, diagnosis, surgical, and non-surgical modalities are the key elements of a successful treatment plan. The webinar will be moderated by T. Sean Lynch, MD with a panel that includes Christopher Visco, MD (Common Running Injuries: What Can You Train Through and How Can You Prevent Them? ), Colleen Brough, PT, DPT, MS, OCS (Gaining That Extra Edge: What Can a Running Analysis Do For You? ), Thomas Bottiglieri, DO (The Fountain of Youth: The Promise of Biologics for the Running Athlete), Elan Goldwaser, DO (Cutting Edge Training Techniques: Tools the Experts Use), Natasha Desai, MD (Rest Better to Run Faster: Recovering Like a Pro), and Fiona Nugent, MS, FNP-BC (P.R. your Marathon: Running Coaches’ Secrets to Success). Dr. Christopher Ahmad and doctors from Columbia Orthopedics recently sat down with WFAN host Kim Jones to discuss treating and preventing ACL injuries. Baseball Health Network founding member Dr. Ahmad, Dr. Lauren Redler, and Dr. Charles Popkin discussed steps athletes can take to avoid injury, warning signs athletes should be aware of, identifying at-risk behaviors, treatment options and recovery expectations. With proper training and education, the risk of ACL injuries can be reduced between 50 and 80%. Baseball Health Network founding member Dr. Christopher Ahmad recently sat down with WFAN host Kim Jones to discuss throwing injuries and Tommy John surgery. 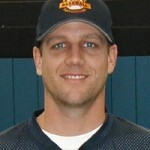 Arm injuries mirroring those of professional athletes are happening to young throwing athletes with alarming frequency. Dr. Ahmad, Dr. T. Sean Lynch from Columbia Orthopedics, and 16-year old pitcher Mike Petze spoke with Kim about major causes, upper extremity warning signs, and some of the challenges presented by the surgery and subsequent rehabilitation.